Thousands of devotees from the Midwestern states, especially from Chicago land used to travel to Pittsburgh to have darshan of Sri Venkateswara swami. While the experience was spiritually rewarding, the time and effort required to make the trip was making it difficult for many to have his darshan as often as their hearts desired. Many felt a void in their spiritual lives and their discontent was wide spread. The state of affairs continued until 1985. 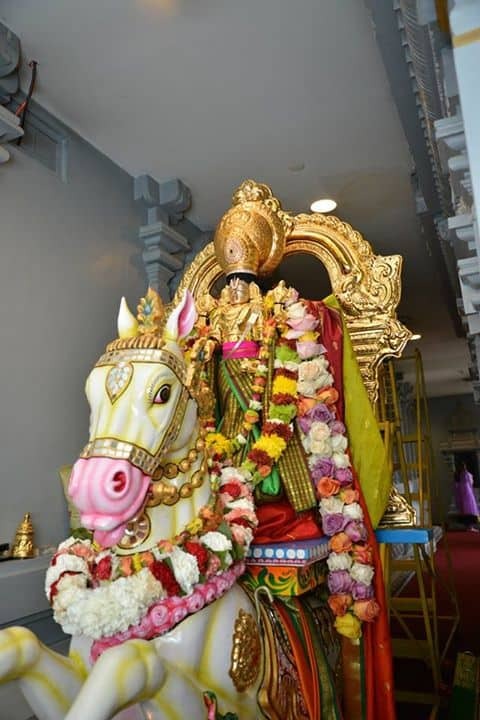 As a result of philanthropy of nine families who donated 20 acres of land with a farm house in Aurora (a far west suburb of Chicago), as a site for the proposed Balaji temple, a beginning was made in the realization of a dream of many. Since Sri Venkateswara swami (Balaji) temple is an institution that has to serve innumerable generations to come, plans were drawn on a magnificent scale related to the means available and the needs of the moment. No pains were spared in making its designs meet the agamic space requirements when at the same time ensuring that it also meets the local building codes, structural safety standards and the needs of the community. Padmasri M.Muthiah Sthapathy, a noted expert on temple construction in India collaborated with Sri Subhash Nadkarni, a reputed architect of Chicago and a devotee of Balaji, and together they designed the temple. This design is an excellent blend of ancient Shilpa shastra and modern architectural technology. Sri Venkateswara Swami Temple of Greater Chicago Aurora This design also served as a model for other temples that were built later in the United States. A unique feature of the temple is provision for circumambulation (pradakshina) inside the temple not only around the presiding deity, but around all the major shrines inside the temple. Members in several other hindu temples across North America and India graciously shared their experience and knowledge on various temple construction related aspects. Their guidance has been very insightful in helping shape our execution plan. Selection of location, cost involved in construction at various locations that were considered were analyzed using facts from engineers. Local engineers and architects expedited initial drafts with their relevant expertise. Such strong support from local talent will be essential to our timely success. Active community involvement helped in the diligent efforts towards seeking multiple alternatives for key construction related decisions. Process for Sthapathi selection, master plan input, fund raising schemes, and alignment with Agamic traditions are a few such decisions. Enthusiastic community support helped bolster the fund raising efforts. To reinforce the significance and power of community involvement in achieving the common goal, here is a quote from The Dalai Lama – “Without the human community, one single human being cannot survive”.